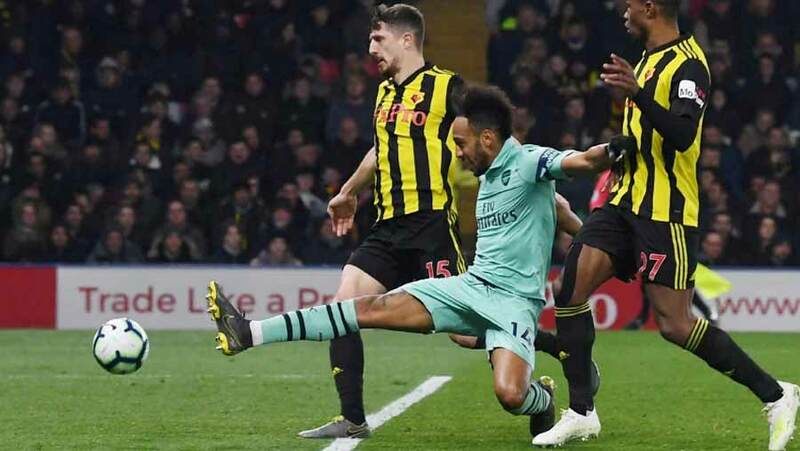 Arsenal moved into the Premier League top four, but made hard work of seeing off 10-man Watford 1-0 thanks to Pierre-Emerick Aubameyang's fortunate early opener on Monday (Apr 15). Goalkeeper Foster gifted the Gunners an opening goal after 10 minutes when he took too long on the ball after collecting a back pass, allowing Pierre-Emerick Aubameyang to charge down his clearance and deflect the ball in. Just a minute later, Watford captain Deeney was sent off for throwing his forearm into the face of Arsenal midfielder Lucas Torreira in a late challenge. They climb two places to fourth in the table, two points clear of Manchester United and ahead of Chelsea F.C. on goal difference.